Custom Valve Concepts, formerly WA Kates, has been manufacturing flow rate controllers for every type of application since 1949, designed to control the flow of everything from air to zinc hydrosulphate. 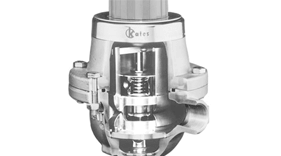 Kates flow rate controllers provide a simple solution for numerous complex flow applications. W.A Kates manufacture a superior range of automatic flow rate controllers, which can be successfully applied to a wide variety of liquid and gaseous applications. Available in sizes from 1/4″ up to 4″ and constructed from a choice of materials with a wide variety of threaded and flanged connections, these controllers can automatically compensate for changes in supply and discharge pressures, whilst maintaining a constant flow setting. For more information visit our flow controllers page. To purchase a Kates flow rate controller contact us on 0118 970 2060 or via email at fluid@fluidcontrols.co.uk.